DarkMatter’s #ItGetsBitter set mocked mainstream LGBT activism. 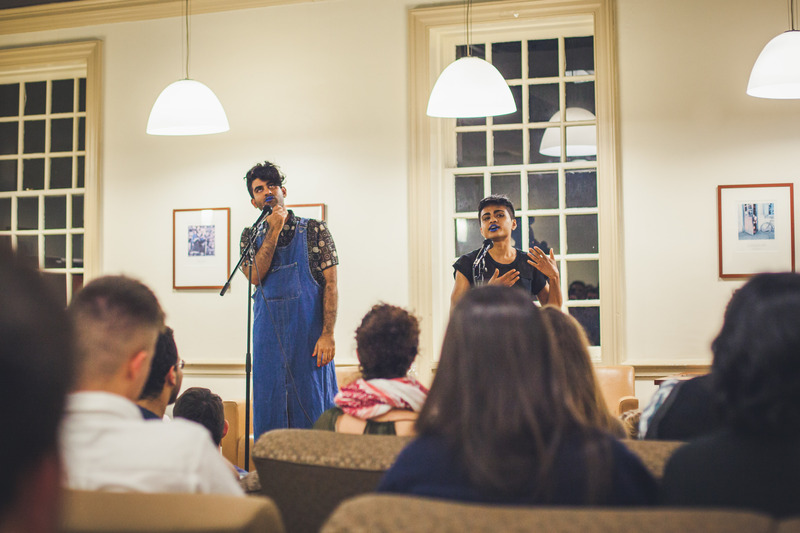 DarkMatter, a trans South-Asian artist and activist collaboration between Alok Vaid-Menon and Janani Balasubramanian, presented a series of spoken-word poems infused with both personal and political statements to a packed Levering Lounge this past Saturday. The group’s performance, which was followed by a brief Q&A session, is part of their larger tour titled #ItGetsBitter, a satirical twist on the LGBTQ campaign’s #ItGetsBetter slogan created by author-turned-activist Dan Savage. Hopkins Students for Justice in Palestine (SJP) brought DarkMatter to the Homewood campus. The group’s president, Mutasem Al’dmour, decided to reach out to the pair after becoming a fan of their work as both artists and activists. The DarkMatter poets spoke about a variety of social justice issues. The relationship between LGBTQ equality and colonialism was at the forefront of DarkMatter’s performance. During their introductory statements the duo explained that their focus was not just on the movement for LGBTQ rights, which they feel has been dominated by upper-class white men and women and generally ignores racial issues. Instead their mission also included abolishing structures of colonialism and capitalism, which they claim have created drastic socioeconomic disparities and a system of conformity. While their strongly held political beliefs and goals were apparent throughout their performance, they also showcased their abilities to write and perform poetry. Each poem was intricately crafted with unexpected comparisons and unapologetic allusions which had the audience laughing, nodding and snapping throughout. At times the performers shouted, the stanzas erupting in a bitter fury. At other points they simply stood with their hands at their sides, allowing the power of their words to impact a silently enraptured audience. 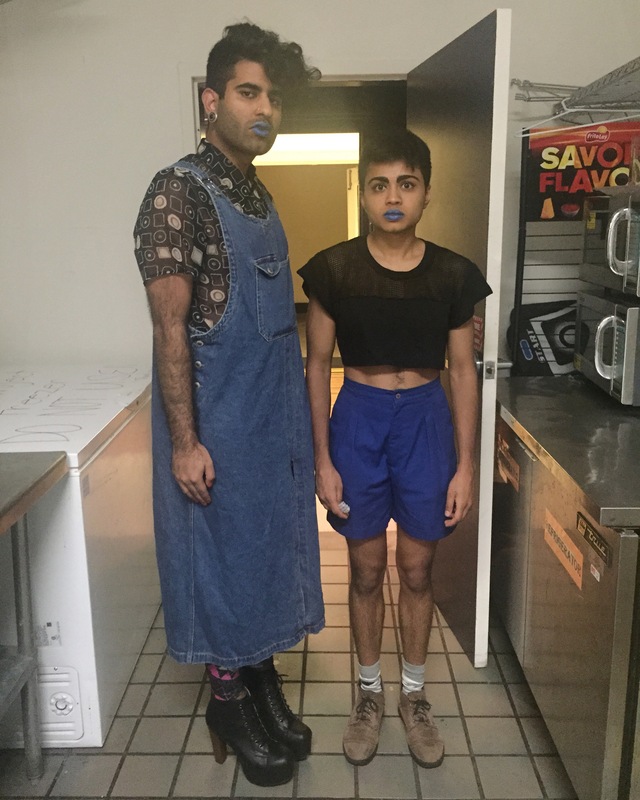 In “It Gets Bourgie” the duo presented a biting critique of Dan Savage and members of the current LGBTQ movement (referred to as “the sisterhood of the traveling imperialism”) who focus on marriage equality and overlook the oppression faced by racial minorities. “There is a difference between being insecure and being incarcerated / Between being lonely and being placed in solitary confinement / You call it a ‘rainbow’; we call it a ‘racial wealth divide’,” they said. In “When Brown Looks in the Mirror and Comes Out White,” Vaid-Menon speaks on the use of the English language, which he sees as a tool for both furthering and masking colonialist agendas. “You see english is for hurting. / english has no words to discuss / itself because then maybe it would have to stop speaking. / in the meantime we will use / ‘colonialism’ instead of ‘gay’ / and maybe things will start making / sense again,” Vaid-Menon said. One of night’s most stirring poems was “Funeral”, an eerie, disheartening account told by Vaid-Menon about a group of people, sitting in a subway car, who are forced to publicly mourn the death of a man who has just jumped in front of the train. Spoken in a pace that slowly escalated with the complexity of the narrative, the poem acknowledged the deep introspection that tragedy can bring. “This is a first time in a long time we’ve been forced to feel like something greater than ourselves in a city where sometimes it takes an accident to remember what the purpose of a body was anyways,” they said. Vaid-Menon’s poem also touched on conditions in the United States that create feelings of isolation and apathy. “To live in America is to live in a constant state of illusion / Is to be thirty people underground on a train unable to hold one another and weep / Is to sit there in silence until we can just keep moving and forget how much death is required in the soil to birth such beautiful denial,” they said. While “Funeral” was one of Vaid-Menon’s more personal, emotionally-moving performances, “Jealousy” was a moment of intense emotional vulnerability for Balasubramanian, who performed it with a particular stillness and simplicity. “Jealousy” elaborated on the meaning of love and the difficulties that come with loving another person whether it is a parent, a lover or a friend. “Some love stories don’t end like anyone is right or wrong / People can just walk away from each other on their now broken feet / It’s hard loving someone who doesn’t want to hold all of your body […] love is excessive to the point of survival,” they said. The poem that received the most laughter from the audience was “White Fetish,” a satire of white liberal culture that often felt more occupied with fair-trade coffee and yoga mats than progressive politics. “I want you to pick me up on the way back from your unpaid internship / I want to jam in your Prius and listen to your hip-hop,” they said. Another more light-hearted moment was in a satirical “open letter” from two South Asian characters in the Harry Potter series, Padma and Pavarti Patil. From the perspective of the characters years after their graduation from The Hogwarts School of Witchcraft and Wizardry, the poem uses a variety of references to the series to touch on topics like cultural appropriation, “white savior” colonialism and the exclusion of minorities from mainstream culture. “It’s funny that ya’ll made this whole school to teach what my grandmother’s been doing for millennia / You call that a truth serum, I call it chai / You can’t ‘expelliarmus’ world history,” Balasubramanian said. Other politically charged poems included “The Bible Belt”, a vivid depiction of Vaid-Menon’s painful experience as a transgender youth in his small hometown in Texas and “I Don’t Take Sh*t from Anyone,” a discussion by Balasubramanian on the donation of digestive microflora from one person to another and the deeply-personal bond this creates. Another nuance of their identities that DarkMatter explored in their work was their role as South Asian Americans in a country where African Americans are systematically-disadvantaged. In “Bring in Brown to Keep Black Down,” Vaid-Menon uses an anecdote of performing as Martin Luther King, Jr. in an elementary school fair to discuss relationships between different racial minorities. Overall DarkMatter’s dynamic performance encompassed an array of issues, critiquing and re-imaging society while capturing the attention of a highly-engaged audience. Al’dmour, who noticed diversity within the audience itself, remarked on the variety of stories and beliefs presented throughout the night.